I scoured my database for ancestors who were born, married, or died on Leap Day, and came up with one match: Catherine Boon, born February 29, 1804. Catherine was my husband’s great-great-great-grandmother. She married George Crites in 1827, and died October 1, 1853 in Ohio. How do I know this? Ah, there’s the rub. 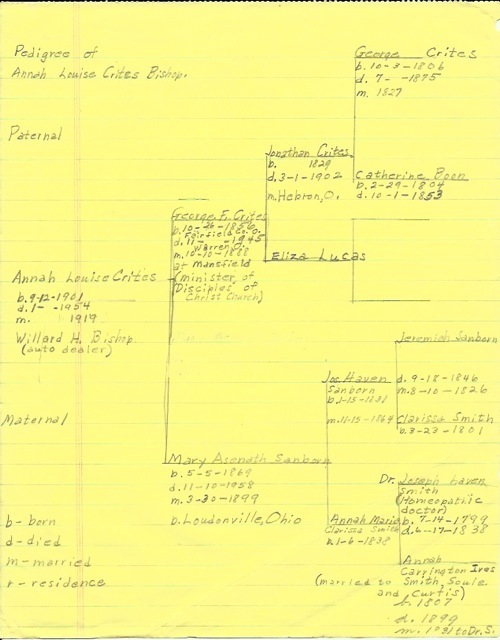 My sole piece of evidence regarding Catherine’s birth is a handwritten pedigree chart drawn by Harold Crites, my husband’s great-uncle. Harold was a college professor and did a lot of family history research before his death in 1973. His chart is painstakingly neat and no doubt reflects his best research, but unfortunately it mentions no sources. I suspect the information about Catherine came from his father, George F. Crites. If he had written evidence, it’s been lost somewhere along the way. Searches for hard information regarding the birth date of Catherine Boon Crites on Ancestry.com and FamilySearch.org have come up empty. She was 41 years old in the 1850 census of Putnam County, Ohio, which suggests a birth year of 1809. She died before death records were kept in Ohio. There are, however, a couple of people besides me who have her in their Ancestry member trees. One says she was born in Pennsylvania, which is what the 1850 census and her son’s entry in the 1900 census indicate. Another offers an alternate spelling of her name, Catherine Bohn, and says she was born in Holland. Both members give the birth year 1804. 1804 was, indeed, a leap year. In fact February 29, 1804 fell on a Wednesday, just like today. It’s an uncommon date and somehow that gives it just a bit more credence. My gut instinct is that for this family tradition of Catherine’s birth date to survive over 200 years, there must be some truth to it. I just need to keep looking for more evidence to prove it. 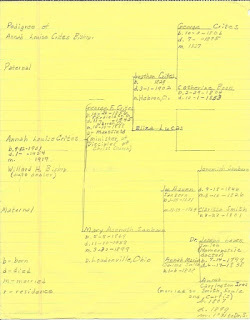 Harold R. Crites, “Pedigree of Annah Louise Crites Bishop”, ca. 1970. Handwritten chart given by Crites to Robert F. Bishop; held in 2012 by Shelley Bishop. The chart does not provide source citations. 1850 U.S. census, Van Buren, Putnam County, Ohio, population schedule, p. 48A, dwelling 2, family 2, George Krites; digital image, Ancestry (www.ancestry.com: accessed 4 May 2011), citing NARA microfilm publication M432, roll 681. Hard to believe we’ve almost reached the end of February. It’s been unusually mild and (dare I say it?) sunny (knock on wood) for this time of year in Ohio. Things were a little uneven this month—one week I hardly did any genealogy, and the next week I worked hard to catch up. I’m grateful for Leap Day this year—I’ll take all the extra time I can get! Study the Allen County Public Library catalog and begin compiling a research to-do list for the upcoming Midwest Geneabloggers Get-Together. Yeah, not started yet. But #1 on my list for this week. I’ll be using Tina Lyons’ 10 Tips for Researching at ACPL on Gen Wish List to help me formulate a plan. Do research connected to my writing goals. Check. Prepare my older daughter’s bedroom for conversion into a home office. Still a work in progress. 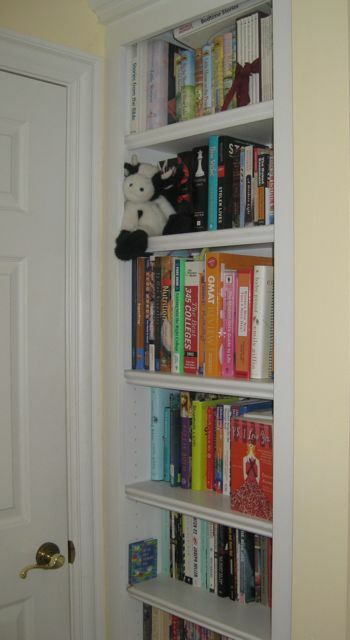 She came home for a weekend and we cleaned out her fully-loaded bookshelves, so it’s looking better. Follow along with Michelle Goodrum’s challenges for The 21st Century Organized Genealogist. I created an Family Archives Inventory chart on Growly Notes after being inspired by the one Michelle posted here. I’m slowly (key word) making time to walk around room-by-room and fill it out. Baby steps. Write eight blog posts. This is seven, so I think I’ll make it (did I mention I’m thankful for Leap Day?). Participate in the Family History Writing Challenge, hosted by Lynn Palmero, by writing 250 words per day. I didn’t keep up with this the way I had hoped. I wrote some, but not consistently. Lynn and her guest bloggers wrote a number of outstanding posts this month, though, and I’ve saved them in Evernote for future inspiration. Write an article and submit it for publication. Just finished. Attend the 2012 Family History Jamboree in Dayton, Ohio. I made it to four out of six sessions. I especially enjoyed hearing Peggy Lauritzen’s presentations on “Migration Trails to the Ohio” and “Using Tax Records to Age and Place Ancestors.” She reminded us how much maps can help our research. My friend Cindy Freed wrote a great post about how the sessions drove home the usefulness of timelines on her blog, Genealogy Circle. 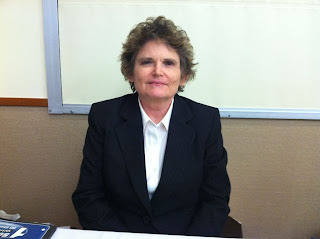 Attend the Pinellas (Florida) Genealogical Society 2012 Seminar featuring Colleen Fitzpatrick. This is the first time I’ve had the opportunity to hear Colleen speak, and she was amazing. She was literally a rocket scientist before turning her analytic skills to forensic genealogy and thorny DNA problems. Colleen delivered four riveting presentations, and at her book-signing table she was as friendly as could be. She gave me some neat ideas about new ways to look at evidence. I didn’t know anyone at the seminar, but I met a really nice woman who’s also from Ohio. I always feel a little uneasy going into a new group like this, but I haven’t regretted it yet. Watch at least two webinars online. 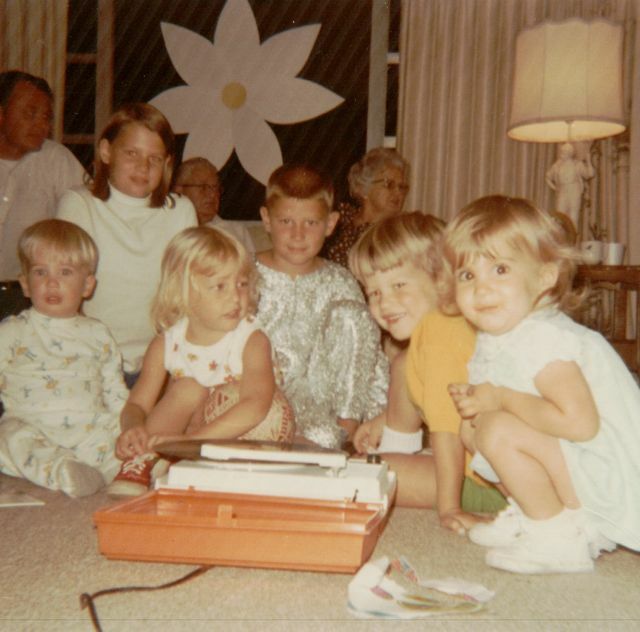 The first one I watched was Michael John Neil’s Seeing the Patterns: Organizing Your Information for the Southern California Genealogical Society. Michael shared various types of charts and diagrams he creates to organize and analyze information. I hastily scribbled down seven pages of notes, and would really like to listen to it again—it was that packed with helpful material. The second webinar was Marian Pierre-Louis’ Ten Brick Wall Tips for Beginners for Legacy Family Tree. I think the title is a bit of a misnomer, because the tips Marian gave are good for researchers at any level. Very worthwhile. If you hurry, the webinar is still available to watch for free here. Oh, and I also watched as many of the RootsTech live streaming sessions as I could. Next best thing to being there. My other big accomplishment for the month was successfully registering for the Advanced Research Methods class at GRIP (Genealogical Research Institute of Pittsburgh) this summer. Woohoo! I know the class will be challenging and intense (just getting in was intense), but I’m really looking forward to it. 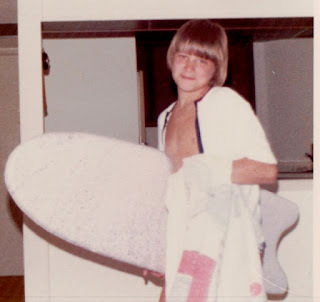 For a fun look at registration day, read my classmate Chris Staats’ post, Getting My GRIP On. There's limited space available in three other great courses at GRIP, so if you're interested, don't wait too long to sign up. The faculty is top-notch. I’ll be back next Monday with my March goals. Best wishes for a great week! 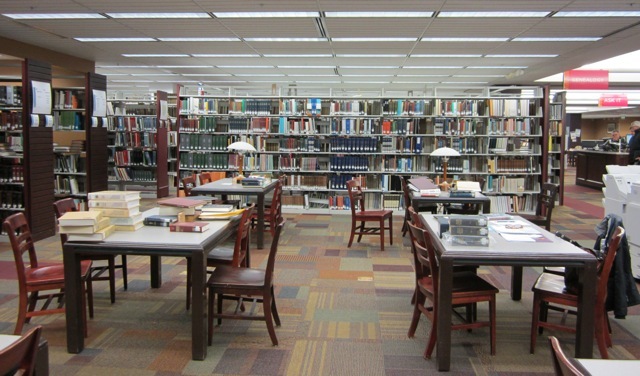 For Week 8 of her series 52 Weeks of Abundant Genealogy, Amy Coffin asks: Genealogy libraries (and dedicated departments in regular libraries) are true treasures in the family history community. 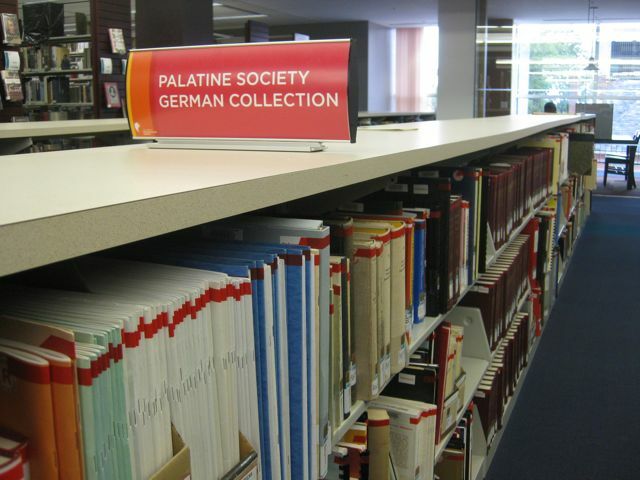 Tell us about your favorite genealogy library. What or who makes it special? 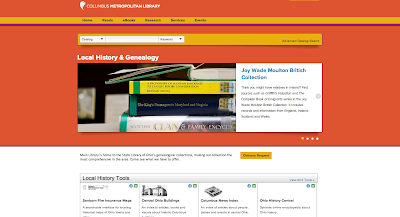 I have two favorite places to do genealogical research in Central Ohio: the Columbus Metropolitan Library main branch and the Ohio Historical Society Archives/Library. To give a more detailed treatment of each, I’ve decided to do two separate posts, with the second one to follow next week. 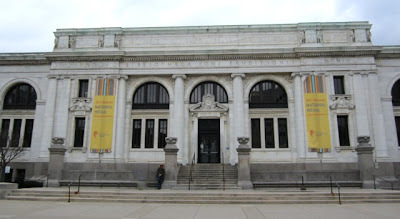 The Columbus Metropolitan Library main branch (CML) is where I fell in love with family history research. The classically elegant old building, a legacy of philanthropist Andrew Carnegie, has grown with the city over the years. Many years ago, I used to descend the worn marble stairs to the children's department. But the crown jewel of the library for me these days is the third floor in the new addition, home of the Genealogy, History, and Travel Department. Thanks to a dedicated staff and the acquisition of several important collections, CML is evolving into a major repository for those tracing their family history. It has resources for all 88 Ohio counties, plus state and county resources for other states. CML also boasts a substantial collection of family histories, military histories and records, city directories, maps and atlases, and lineage society books. Resources for tracing British, Huguenot, and German-speaking ancestors are particularly strong. 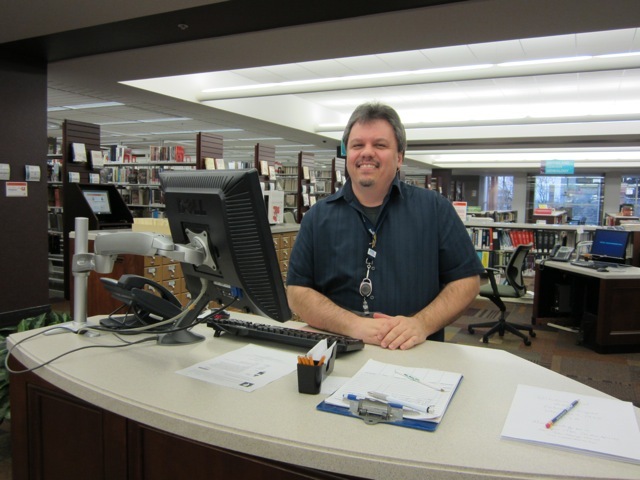 Russ Pollitt, department head, is active in local and state genealogy organizations. He and his staff have been busy digitizing the library’s photographic and postcard collections for the Columbus Memory project. A microfilm reading room on the same floor holds collections of over 20 historic newspapers, all censuses for Franklin County, and the Civil War prison records of Camp Chase, among other things. Microfilm printouts are free. 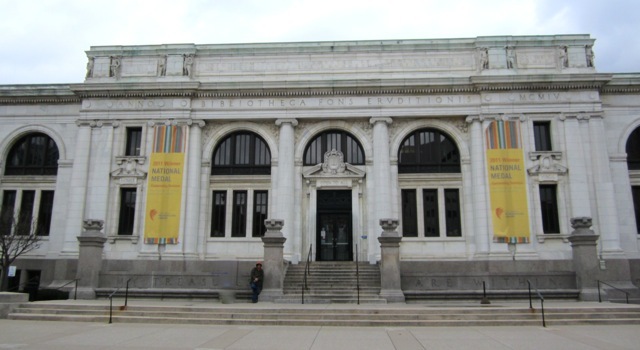 If you plan to go, here's some good things to know: The main Columbus Metropolitan Library is located at 96 S. Grant Ave., Columbus, Ohio 43215; phone (614) 645-2275. There’s an on-site parking garage (take the parking ticket into the library with you; you’ll pay before leaving the building). Photocopies are 10 cents. Computers are available in the department, or bring your own. CML was named Library of the Year by Library Journal in 2010. Today I’m sending birthday wishes out to my little brother, who is celebrating a milestone year. Growing up, I was always kind of jealous because, by sharing a birth date with the illustrious George Washington, he never had to go to school on his birthday. What a lucky kid! Fortunately, I’m over that now. And anyway, it’s all been merged together for President’s Day, so there. I was a proud big sister from the moment I saw him. For the first few years we shared a bedroom. We were constant companions. 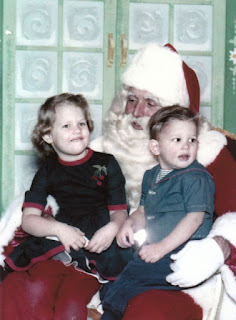 I taught him all the important stuff, like how to ask Santa for what you wanted. Of course we never fought. 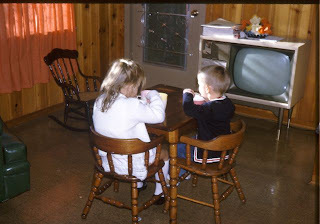 He never drew on my dolls with markers or pulled the heads off my Barbies. When my friends came over to play, he always left us alone. You can tell just by looking at him that he was an innocent kid. 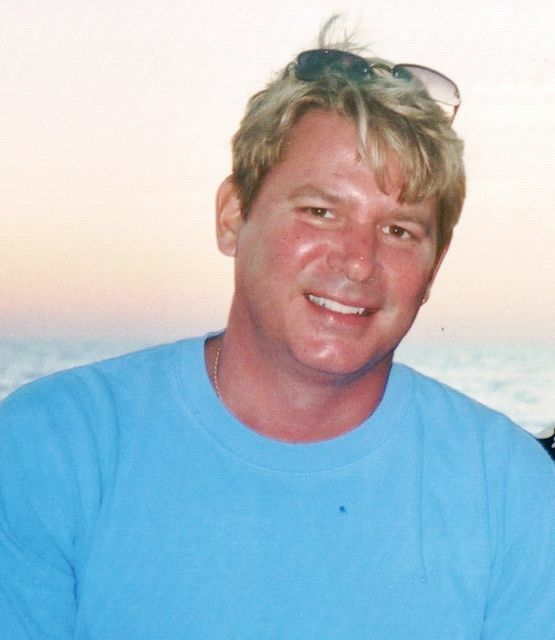 …but he always liked hanging out on the beach the best. So the next time I'm hesitant to research the siblings of my ancestors, I'll think about all the history my brother and I have shared, and hesitate no more. 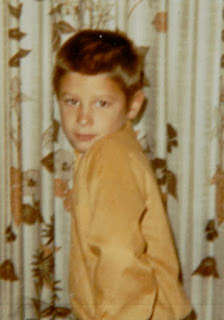 And now that I’ve embarrassed him as only a big sister can, the only thing left to do is wish him a happy birthday. And many, many more! Clarissa Annah Smith, who married Joseph Haven Sanborn, was my husband’s great-great-grandmother. She went by the name Clara Smith when she was young, and Clara Sanborn after she married. This was probably to distinguish her from her father's sister, Clarissa Smith, for whom she was named. In one of those twists that makes family history research so difficult interesting, her aunt Clarissa Smith later became her mother-in-law. As a genealogist, I’m so grateful for her nickname, Clara—keeping track of two women named Clarissa Smith who both became Clarissa Sanborns gets a bit confusing! When Clara Sanborn died, she received a beautifully detailed obituary in the Loudonville (Ohio) Democrat. It was published on January 8, 1914. Clarissa Annah, daughter of Dr. J. H. and Annah Yves [Ives] Smith, was born in Loudonville, Ohio, January 6th, 1838. When she was six months old her father died, leaving five children. She was married to Joseph Haven Sanborn on November 15th, 1864, who preceded her in death in August, 1895. To this union were born four children: one daughter, Laura, died in infancy; three survive: Haven L., Tenabo, Nevada, Gillman Stanton, Cody, Wyoming and Mrs. Mary Crites, Hiram, Ohio, and one sister, Mrs. Jane Roberts, of Weiser, Idaho. When she was two years old her mother married Myron Soule, of Geauga county, where she made her home until her marriage, when she removed to Loudonville, which was her home until last August, when, failing in health, she went to stay with her daughter where she died last Tuesday morning, December 30th, at the age of 75 years, 11 months and 24 days. She was a student of Hiram Eclectic Institute in the years 1855, 1856 and 1857. In early youth she confessed Christ and united with the Christian church at South Russell. Her home was always the preachers’ home. She was a life member of the C. W. B. M. and her life was full of good deeds. The remains were brought to Loudonville last Wednesday evening and funeral services were conducted by her pastor, Rev. A. D. De Bord on Thursday at 1:30 p.m., at the residence of her son, H. L. Sanborn, on North Water street. Interment in the Loudonville cemetery. Another notice appearing in the same issue gave the names of some funeral attendees: "Sherman Mumper, of Akron, Rollin Smith and Joel Burnett, of Chagrin Falls, Mrs. Emma Morris, of Columbus, and Mrs. W. H. Baumgardner, of Wooster, were here last Thursday attending the funeral of Mrs. Clara A. Sanborn." More clues to follow up on. I’ve already confirmed most of the information from the obituary with other sources, and haven’t found any discrepancies yet. I plan to make a trip to Loudonville this spring to visit her tombstone. But I'm still missing a photograph of Clara. If anyone researching Sanborn genealogy, Soule genealogy, or the family of Dr. Joseph Haven Smith (Clara’s father) has information or photographs to share, I would love to hear from you! Clarissa Annah Smith Sanborn obituary, Loudonville Democrat (Loudonville, Ohio), 8 January 1914, p. 5, col. 6. Clara A. Sanborn funeral visitors, Loudonville Democrat (Loudonville, Ohio), 8 January 1914, p. 1. col. 1. Last week, it seemed like all eyes of the genealogy community turned to Salt Lake City. With over 4000 conference attendees and countless numbers watching via live streaming, RootsTech 2012 arguably had the biggest audience of any genealogical event to date. As the first keynote session was about to start on Thursday, I had the RootsTech site up in one window and my Twitter feed buzzing away in another. Those of us planning to watch from afar were excited to be part of the action. I joked with Tina Lyons of Gen Wish List that maybe we could find some seats in the front row. When the program began a few minutes later, I stared transfixed at the screen, captivated by the flawless quality of the feed. It seemed my wish for a front row vantage point had been granted. Jay Verkler laid out a fascinating vision for the future with a number of “wow” moments right off the bat. I’ll leave it to others to analyze the feasibility of his proposals for new ways of presenting, sharing, and collaborating genealogy data. Suffice it to say I was impressed—and not only by his hair. By the end of that first session, I was hooked by the passion and extent of his message and the technology that allowed me to watch it from my kitchen counter, 1700 miles away. 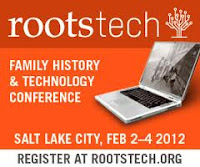 I continued to tune in to RootsTech whenever my schedule allowed until the conference ended Saturday. That sense of marvel never diminished. Sure, I wished at times I could see sessions other than the one being streamed. I wished I could browse through the exhibit hall. And above all, I wished that I could meet and socialize with people at the conference. But even from a distance, I felt surprisingly engaged with RootsTech. Is there anything I would change, from the vantage point of a virtual participant? Well, it’s a rare event that couldn’t benefit from some improvement. My main suggestion is to choose the live streaming sessions carefully for their appeal to a relatively tech-savvy crowd. I think most people who watch from home are already using a fair amount of technology, so they appreciate in-depth presentations rather than general overviews (that’s probably true of most people who pay to go to RootsTech, too). Personally, I would willing to pay a small amount to download some of the other sessions, had they been taped. The final word? Thanks. Thanks to FamilySearch as well as the speakers who agreed to share their syllabi and presentations, the participants who tweeted and messaged their way through the conference, and the unseen technicians who brought live coverage to those of us at home. From this freeloader’s perspective, it was a job well done. Study the Allen County Public Library online catalog and begin compiling a research to-do list. I'll be visiting Ft. Wayne for the first time during the upcoming Midwest Geneabloggers Meetup, coordinated by Tina Lyons of GenWishList and Terri O’Connell of Finding Our Ancestors. If you’re thinking about going, see Terri's post for hotel information, and let me know, too! Prepare my older daughter’s bedroom for conversion into a home office (it will continue to double as our guest bedroom). If I get brave enough, I might post some “before” pictures so you can see why I need to do this. 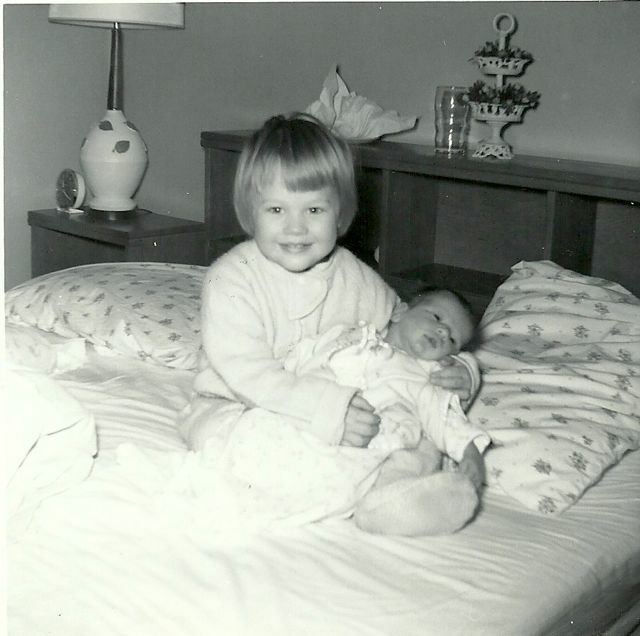 Participate in the Family History Writing Challenge, hosted by Lynn Palermo. I’ve pledged to write 250 words a day. This fits into my yearly goal to write for 20 uninterrupted minutes at least five days a week. Time will tell how much of this I can actually get done between my other commitments, which include a trip to visit my daughter at college. One thing’s for sure—with only a little over three weeks left in the month, I’d better get busy! My mother gave me this picture for Christmas. 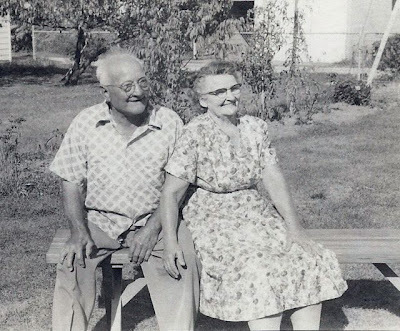 It’s of my great-grandparents, Harry and Mabel Herrel, sitting in the summer sun. 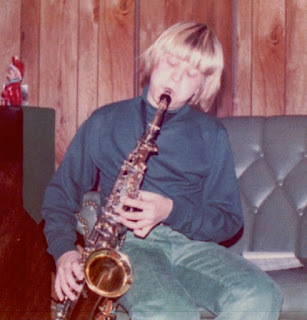 We think it was taken in the late 1950's. Don’t they look happy together? Harry F. Herrel, born 29 November 1888 in Cincinnati, Ohio; married Mabel Seely on 12 October 1909 in Columbus, Ohio; died 3 July 1964 in Columbus. Mabel Seely, born 22 July 1891 in Columbus; died 30 September 1975 in Millersport, Ohio. Five children: Herbert, Pauline, Frederick (my grandfather), Richard, and Robert Herrel. Pauline, the only girl, died on Christmas Eve at the age of three weeks. The four boys grew up to have families and enjoy long lives. All content copyright 2016, Shelley Bishop, unless otherwise attributed. If you wish to reproduce material to share with others, please get in touch with the author at the email below. Thank you. All photographic and content rights reserved by author.. Simple theme. Theme images by gaffera. Powered by Blogger.